We’ve been writing a lot about comparing windows in the recent weeks. But getting the best window for your replacements doesn’t always mean the best performing. In fact performance levels of different windows today can be adjusted by using additional features to improve heat gains or decrease heat loss in the windows. This is especially important, because like most Canadians, your windows probably face at least two different sides of the house, and may experience very different amounts of sun exposure. So how can you compare replacement windows without becoming an expert in the field? Thankfully for most homeowners, there are simplified ways of comparing windows designed specifically with the consumer mind. Another great thing is that this information is publically available on the Natural Resources Canada website, so you can tell for yourself which window company has the best product. What are Canadian replacement window Energy Ratings? Energy Ratings (ER) is a metric rating given to a window based on the unit’s performance levels under winter heating conditions and takes into account the balance between heat loss through thermal transmittance and air leakage, and solar heat gain through the window or door. ER ratings rank between 0-50, the higher the rating, the more efficient the window. ER ratings incorporate the window’s U-Value and SHGC into the performance ratings. U-Value is a measure of how much heat a window system loses. Note the use of the word system here. Traditionally window performance was often judged by the R-value of the materials used, but modern windows often use different materials with different R-values, so it is not accurate to measure these values in relation the window as a whole. The lower the U-Value, the less heat is lost through the whole window. Some of the best thermal windows on the market achieve a U-Value of 1 or slightly lower. Solar Heat Gain Coefficient (SHGC) is a fraction of how much UV heat is allowed to pass through the glass into your home. SHGC can range from 0 to 1, but the higher the coefficient, the more heat your windows gain from the sun. SHGC also has a direct effect on the energy rating of a window. It only makes sense: a window that allows more heat in, is technically more efficient because it in turn requires less energy to keep the home warm. However, the efficiency of modern vinyl windows is relatively high to a point where windows with higher SHGC ratings can actually overheat rooms even in the winter time. This is especially true for unshaded windows facing south or west, and in homes with high window to wall ratio. What’s better for your windows: Higher ER rating, higher SHGC rating, or a lower U-Factor? There is no single answer to which one factor is right for a window replacement. The best way is to recognize which of these ratings best suits windows in each room of your house. And one important feature comes into play here: Low-E coatings. We’ve discussed Low-E extensively in previous articles. For the purpose of this article it’s worth to mention this: Low-E coatings on windows improve (decrease) a window’s U-Factor by slowing heat loss, at the expense of Solar Heat Gains. Most windows on the market today come with some kind of Low-E coating, but the great thing is that you can add extra Low-E in multi-pane windows. Extra Low-E coatings are great on those south or west facing windows to prevent overheating, while north and east facing rooms benefit from a single application of Low-E that reduces heat lost from those units. If you are really into the science of how U-Factor and SHGC correlate, you can check out this full Review of Energy Rating Procedure in Canada. The report tests whether ER ratings are still the best way to compare windows (they are), but also suggests that U-Value and SHGC are not overlooked when it comes to comparing windows. While the ER number is a good way to compare windows, if you truly want to get the right windows for each room, consider the window’s U-value and SHGC numbers, as well as how additional features will impact these performance ratings. Which ER rated window is right for my city? Besides simplifying the window rating process, ER numbers are also great for understanding which windows are considered efficient in the geographic region you live in. 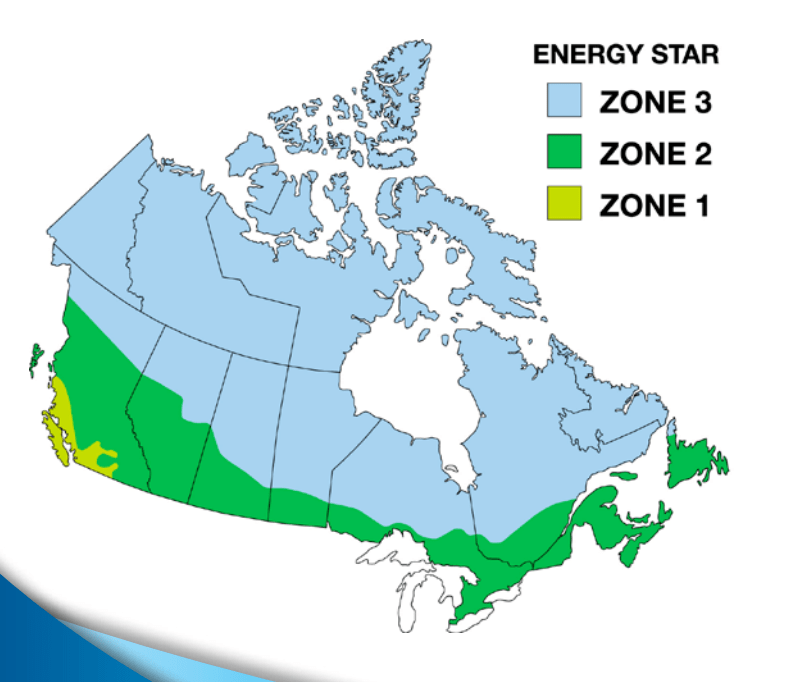 ENERGY STAR has outlined three specific climate zones in Canada. In order to be considered efficient in these areas, window have to meet not only specific ER number ratings, but also minimum performance U-factor ratings. You can find specific information about climate zones and their respective ER and U-value numbers on this Natural Resources Canada site. Although ER Ratings are based on window performance information from the Canadian Standards Association (CSA), they are not always the most accurate representation of a window’s performance. CSA often tests windows only for standard sizes, and bigger windows are generally less efficient. Windows are generally tested for performance in a controlled environment. Once installed into the wall structure, the performance levels are directly impacted by the quality of the installation. Even the best windows can lose heat if they are not installed properly. ER ratings only evaluate a window’s performance based on the integrity of the window system. The performance levels do not assume the effects of installation. How To Compare Replacement Windows Overall rating: 4.9 out of 5 based on 41 reviews.